We will use the same SQL Server database that powers our showcase Management Dashboard. To keep things simple, we will plot the Total Sales Revenue of each Year. Right-click the project’s name in Solution Explorer > Add New Item > Web Form. Keep the name as Using_MS_SQL_Server.aspx. Right-click the project’s name in Solution Explorer > Add ASP.NET Folder > App_Data. Right-click App_Data > Add Existing Item > Browse to the folder containing Sample SQL Server Database. 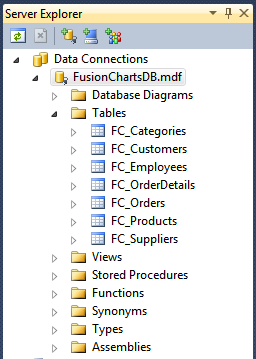 As explained in the previous post, you can supply data to FusionCharts using the Data String method or the Data URL method. First, let us try the Data String method. In Using_MS_SQL_Server.aspx, create a Literal tag with a unique ID. Chart Container Page – The page which embeds the HTML code to render the chart. This page also tells the chart where to load the data from. We’ll use the Using_MS_SQL_Server.aspx page for this. Data Provider Page – This page provides the XML data to the chart. 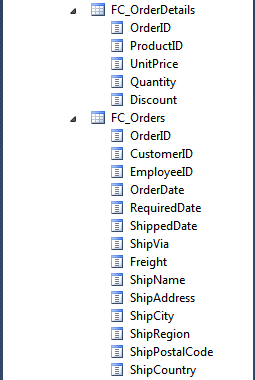 We’ll name this page as DataProvider.aspx.Keep the code in Using_MS_SQL_Server.aspx as it is. Delete all but the first line from DataProvider.aspx. "", // String containing the chart data. Leave blank when using Data URL. We use the Server.UrlEncode() method to take care of any special characters in the URL / querystring. The data for this chart is provided by DataProvider.aspx.cs. You can see this by opening the Network tab in either Firebug or Chrome’s Developer Tools. In the third part of this series, we will add drill-down functionality to the above chart, so that we can drill-down into the year 1995 and see monthly revenue for that year. You can read more about drill-down charts in the FusionCharts Documentation. Stay tuned.. Please drop us a mail at “support[at]fusioncharts[dot]com” along with the sample code. We would check the sample and suggest a solution.